Can Proper Nutrition Regulate Mood Swings in Bipolar Depression? Can Faulty Wiring Lead to Impulsive Violence? COLUMBUS, OH; March 9, 2015—Children whose parents think they're God's gift to the world do tend to outshine their peers—in narcissism. In a study that aimed to find the origins of narcissism, researchers surveyed parents and their children four times over one-and-a-half years to see if they could identify which factors led children to have inflated views of themselves. Results showed that parents who "overvalued" their children when the study began ended up with children who scored higher on tests of narcissism later on. Overvalued children were described by their parents in surveys as "more special than other children" and as kids who "deserve something extra in life," for example. "Children believe it when their parents tell them that they are more special than others. That may not be good for them or for society," said Brad Bushman, co-author of the study and professor of communication and psychology at The Ohio State University. Bushman conducted the study with lead author Eddie Brummelman, a postdoctoral researcher at the University of Amsterdam in the Netherlands. The study appears in the early online edition of the Proceedings of the National Academy of Sciences. Brummelman said that parents with the best of intentions may overvalue their children, thinking that will help boost their self-esteem. "Rather than raising self-esteem, overvaluing practices may inadvertently raise levels of narcissism," Brummelman said. While the dangers of narcissism are well known, its origins are not, according to Bushman. This is the first prospective study to see how narcissism develops over time. The study involved 565 children in the Netherlands who were 7 to 11 years old when the study began, and their parents. They completed surveys four times, each six months apart. All the surveys used in the study are well established in psychology research. Parental overvaluation of children was measured with a scale that asked moms and dads how much they agreed with statements such as "My child is a great example for other children to follow." Both children and parents reported how much emotional warmth parents showed, with participants indicating how much they agreed with statements like "I let my child know I love him/her" (or "My father/mother lets me know he/she loves me"). Children were measured for levels of both narcissism and self-esteem. While many people believe narcissism is just self-esteem on steroids, that is not true, according to the researchers. In this study, children with high self-esteem, rather than seeing themselves as more special than others, agreed with statements that suggested they were happy with themselves as a person and liked the kind of person they were. "People with high self-esteem think they're as good as others, whereas narcissists think they're better than others," Bushman said. 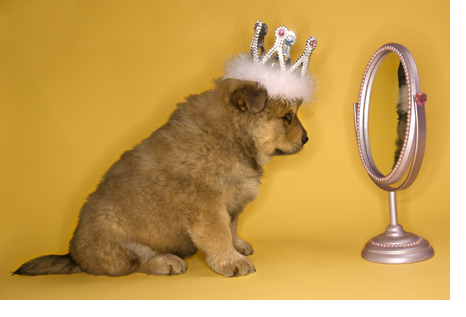 Self-esteem and narcissism also develop in different ways, the study found. While parental overvaluation was associated with higher levels of child narcissism over time, it was not associated with more self-esteem. In contrast, parents who showed more emotional warmth did have children with higher self-esteem over time. Parental warmth was not associated with narcissism. "Overvaluation predicted narcissism, not self-esteem, whereas warmth predicted self-esteem, not narcissism," Bushman said. Parental overvaluation was connected to narcissism even after the researchers took into account the narcissism levels of the parents. In other words, it is not just that narcissistic parents have narcissistic children - the parental overvaluation played a key role. A previous study by Brummelman, Bushman, and several colleagues showed just how much some parents overvalue their children. In this study, parents were presented with topics that their 8- to 12-year-old children should be familiar with, such as the astronaut "Neil Armstrong" and the book "Animal Farm." The parents were asked how familiar they believed their children were with those items. But the researchers also included items that did not exist, such as "Queen Alberta" and "The Tale of Benson Bunny." "Overvaluing parents tended to claim that their child had knowledge of many different topics—even these nonexistent ones," Brummelman said. The researchers noted that parental overvaluation is not the only cause of narcissism in children. Like other personality traits, it is partly the result of genetics and the temperamental traits of the children themselves. "Some children may be more likely than others to become narcissistic when their parents overvalue them," Bushman said. Bushman, who is a father of three children, said his research on narcissism "has changed my parenting style." "When I first started doing this research in the 1990s, I used to think my children should be treated like they were extra-special. I'm careful not to do that now," he said. "It is important to express warmth to your children because that may promote self-esteem, but overvaluing them may promote higher narcissism." Brummelman said these results suggest a practical way to help parents. "Parent training interventions can, for example, teach parents to express affection and appreciation toward children without telling children that they are superior to others or entitled to privileges," he said. "Future studies should test whether this can work." “Origins of narcissism in children,” Eddie Brummelman, Sander Thomaes, Stefanie A. Nelemans, Bram Orobio de Castro, Geertjan Overbeek, and Brad J. Bushman. PNAS 2015 112 (12) 3659-3662; published ahead of print March 9, 2015, doi:10.1073/pnas.1420870112.